If Hillary Clinton were to run for President in 2016, she'd have a lot of ducks to get in a row — fundraising, amassing an army of volunteers, getting key endorsements, building a killer staff to fuel her unstoppably Hillary Machine. Dozens of extra-shiny flag lapel pins, I'd imagine. Here's something that would probably be low on her priority list: a "Presidential diet." But here we are. Talking about it. The New York Post gushes that Clinton was recently seen dining in Connecticut with Dr. Mark Hyman, a "dieting guru." Sources say Hillary [...] drove an hour from her home in Chappaqua for the three-hour dinner with Hyman and his girlfriend. Hyman runs the Ultra Wellness Center in Lenox, Mass., which helps promote healthy weight and metabolism. The center’s Web site home page includes an article titled, “How hidden food sensitivities make you fat.” Hyman also wrote the book “The Blood Sugar Solution.” Bill Clinton, who lost 24 pounds in less than two years on a vegan diet he started in 2010, endorsed the book: “I’ve made drastic changes to my own diet and exercise routine since my heart troubles surfaced in 2004, and I hope Dr. Hyman’s new book will inspire you as he has inspired me.” An inspired Hillary ate a healthy meal of grilled salmon and seasonal fruits. CBS News reported on the incredible developments as well, asking, "Is Hillary Clinton trying to get in shape for a possible 2016 presidential run?" Goody goody gumdrops! This must mean Hillary is running in 2016! I mean, isn't it obvious? The only reason a person would have dinner with a longtime family friend who happens to know a lot about dieting would be to get dieting tips. And the only reason Hillary Clinton would want dieting tips is because she wants to run for President. And if she were running for President, it would be of utmost importance that she first focus on getting in shape or losing weight, since she really hopes to rock the American flag bikini portion of the election — after all, the Oval Office has a strict "No Fat Chicks" policy. Look, I get that both the liberal and conservative media has a big hard on for a Clinton 2016 run. Hell, I've got a big hard on for a Clinton 2016 run. But extrapolating from a dinner with a doctor that Hillary is getting PRESIDENTIAL DIETING TIPS is completely absurd and eye-rollingly sexist. Why would a woman opt to receive health advice from a doctor at a restaurant rather than a doctor's office? 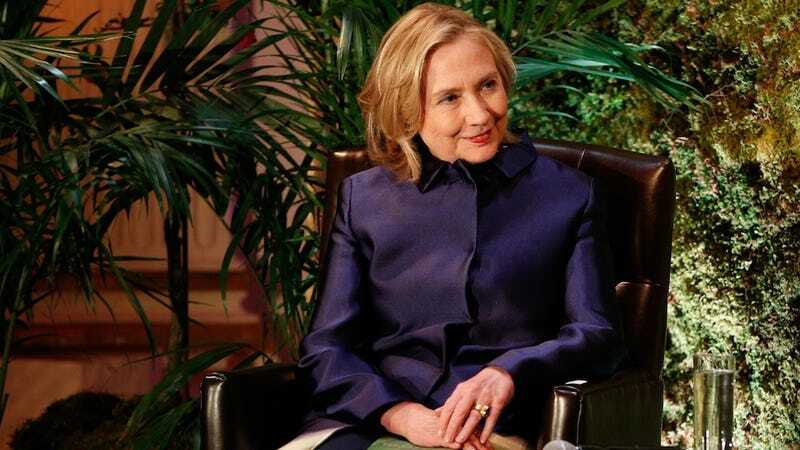 If Hillary Clinton had attended the opera with Martha Stewart, would the media say she was "fueling Presidential speculation" by clearly attending the opera so she could get Presidential bake-off tips? BILL CLINTON SAYS HE LIKES COOKIES!, the Post would report, then listing a quote from a 1997 interview where Bill talked about how chocolate chip cookies are delicious.